Residents of Israel's Golan Heights collect gifts of toys, games, and candies for displaced Syrian children. On Tuesday night the Bashan Division's "Good Neighbor" command conducted a unique operation to transfer donations and care packages from the residents of the Israeli Golan Heights to the camps of displaced Syrians in the Syrian Golan Heights, the IDF reported. 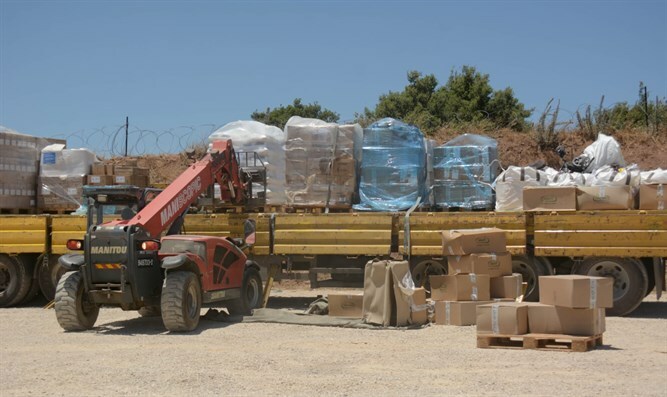 The donations were collected by the Golan Regional Council's donation center, where hundreds of care packages donated by the Council's communities arrived over the past week. The gifts included hundreds of personal gift bags which contained toys, crayons, games, candies and notes from the children of the Golan. The supplies were brought to the IDF, which transferred them via two military operations to the other side of the border fence. The packages are addressed to the camps in the North and South of the Syrian Golan Heights. "Good Neighbor" Operation Commander Lieutenant Colonel E said, "This is a unique and exciting operation. The 'Bashan' Division is responsible for preserving the security of the residents of the State of Israel, and of the Golan Heights in particular. Through the 'Good Neighbor' command, it carries out the mission of defending them in partnership with the citizens (of the area). "All of this was done for our neighbors on the other side of the fence, who have been educated to hate Israel and everything related to it, and in recent years have understood that the only country which has aided them was the same one they feared." Golan Regional Council Head Eli Malka, who initiated the collection, said, "For six years, a cruel war that claims the lives of hundreds of thousands of people has been taking place in Syria, and the world remains quiet in the face of this horror." "We, the residents of the Golan, look right over the fence and see the people fleeing from the killing fields together with their children and clinging to the fence with Israel. We feel the moral obligation, in accordance with our values, to send humanitarian aid and as much as is possible to build a relationship of humanity with those who have always been our neighbors on the other side of the fence. "The residents of the Golan have come together wholeheartedly to raise and collect supplies and make personal gift bags for the Syrian children to give them a moment of happiness in a great chaos. "We thank the IDF and the 'Good Neighbor' command for the assistance in collecting and transferring supplies to the camps of the displaced."